The Good Smile Company has announced plans to launch a Nendoroid version of PlayerUnknown’s Battlegrounds’ “The Lone Survivor” based on the game’s key art. Preorders are already live for the figure, which will cost 4,815 yen. Preorders will close on March 21, 2019 at 12:oopm JST (or 9:00pm on March 20th CST). For those interested in purchasing the figure internationally, the company has provided a list of its international partners. Presently, the release is set for September 2019. 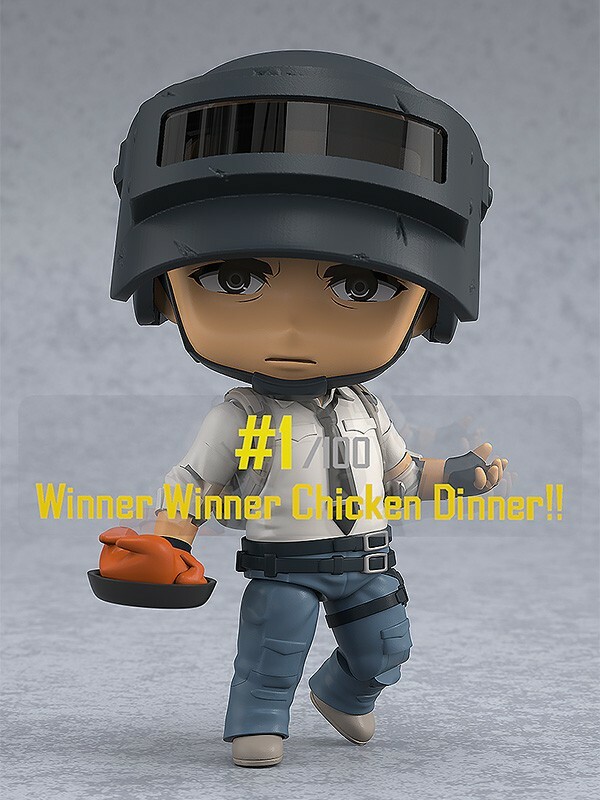 This PUBG Nendoroid is more than a mean-mugging face. In fact, if a buyer so chooses, the Lone Survivor’s face can be hidden from view. Simply lower his helmet’s visor. The figure’s full articulation allows for a range of poses, all of which compliment the figure’s optional parts of an AK, M9 pistol, and frying pan. Curiously, the product description makes no mention of it, but the figure seems to also come with a tiny toy chicken. A cooked chicken, that is. According to additional details featured on the product page, this Nendoroid stands approximately 100mm tall. He does not stand on his own, however. Rather, a stand will be included that helps prop him up. In other PUBG-related news, the Vikendi map landed on PlayStation 4 a few weeks ago, offering players a smaller, snow-filled map to wreak havoc across. When another new update will go live on the console currently remains unknown. At least fans have a cool new Nendoroid to anticipate.